I haven't posted anything for quite some time. 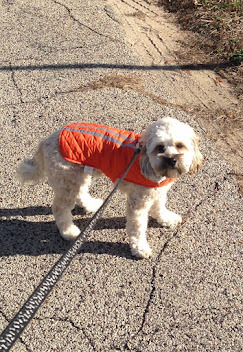 My wildlife stories have become repetitive. My holiday decorations are so similar, I can't tell the years apart. 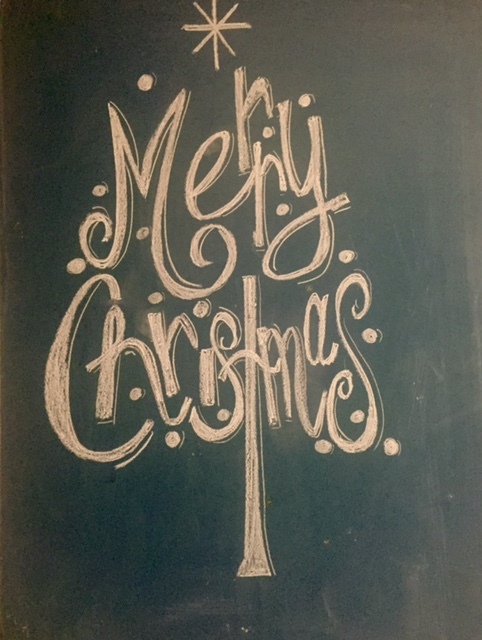 If you are curious and a new reader, just type Christmas in the search box or any other topic you are interested in from my world like knitting or recipes. A list of some of my older blogs will appear. I have written over six hundred, so maybe there is something of interest to see. 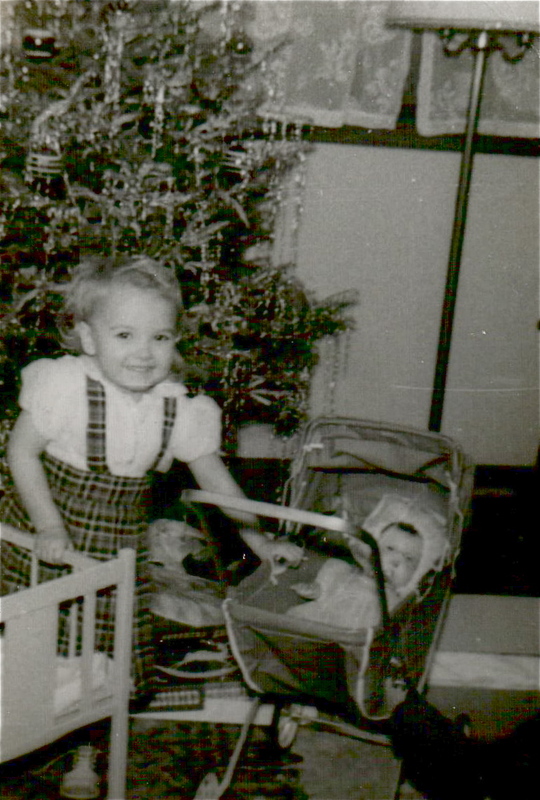 Since I have written so much about recent times, I decided to post a few pictures of Christmas's when I was a child. It is no secret I am sixty eight years old. 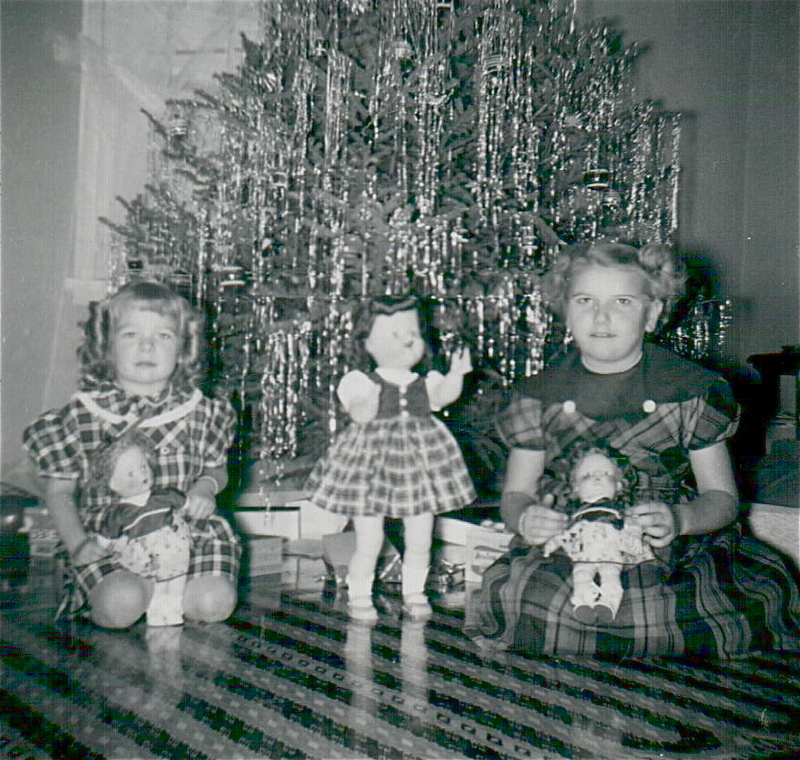 Most of my Christmas photos are from the 1950's. It is so much fun to see how different things looked back then. The first year's picture is from the late forties. My sister wasn't born yet, so I was the queen bee. I was my grandparents oldest grandchild. That all changed rather quickly, but for a few months it was all about me. It looks like I got a dolly bed, doll buggy and a doll. Of course I don't remember any of these Christmas's, so I am so happy I found a box of old photos and recognized myself. The Cabin Countess at age 2 in about 1949. Then I found this beautiful colored picture. 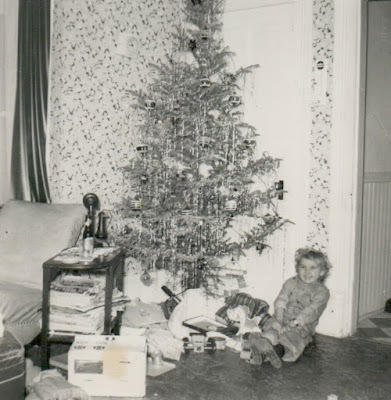 It says May 1952 on the back, but it is clearly Christmas so I assume it was from the previous Christmas of 1951. Those were the days when the cameras had to use film and then a completed roll of film had to be developed. Then the date it was developed was usually stamped on the photo, not the date it was taken. 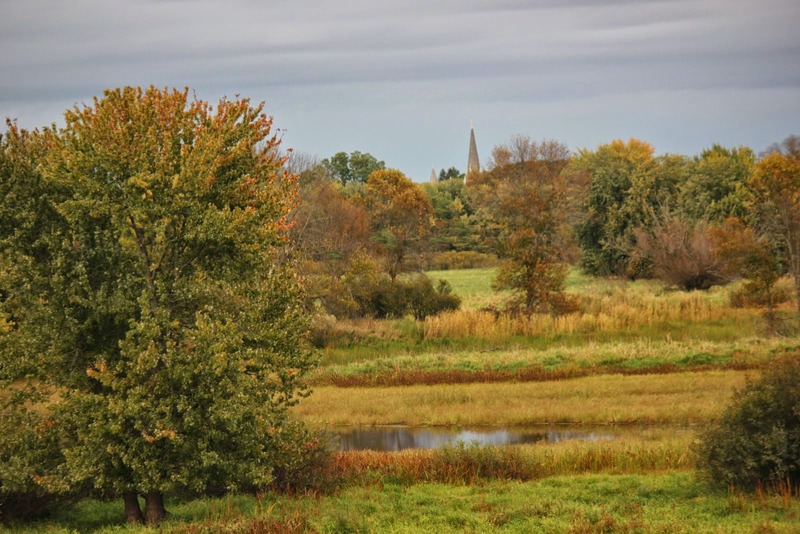 Who would have guessed about digital photography of today? 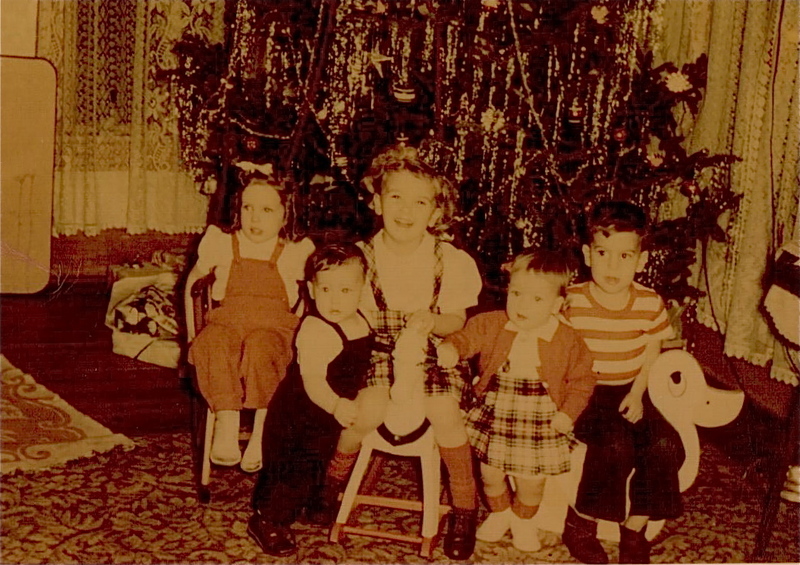 This is left to right, Carol (my dad's cousin), Mark (my cousin), Me, sister Janice 1 year old and Jeff (dad's brother). The next one I found didn't have a date on it, but it looks about the same year as the one above. It looks like I am about 4 years old. I probably liked the coveralls I had on more than the dress. Notice the old phone on the table. This is in the house my parents lived in for much of their retirement years. 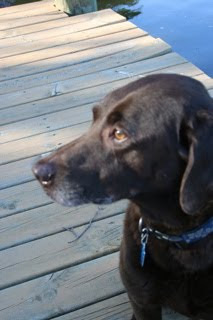 They lived there from 1998 until they had to move due to ill health in 2011. This house was in the family for a long time. 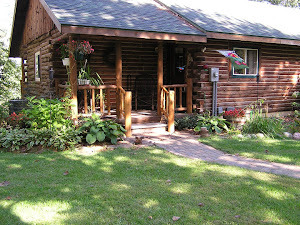 My parents and my grandparents took turns owning this house for as long as I remember. I believe this is the Christmas of 1951 when grandma and grandpa lived there. 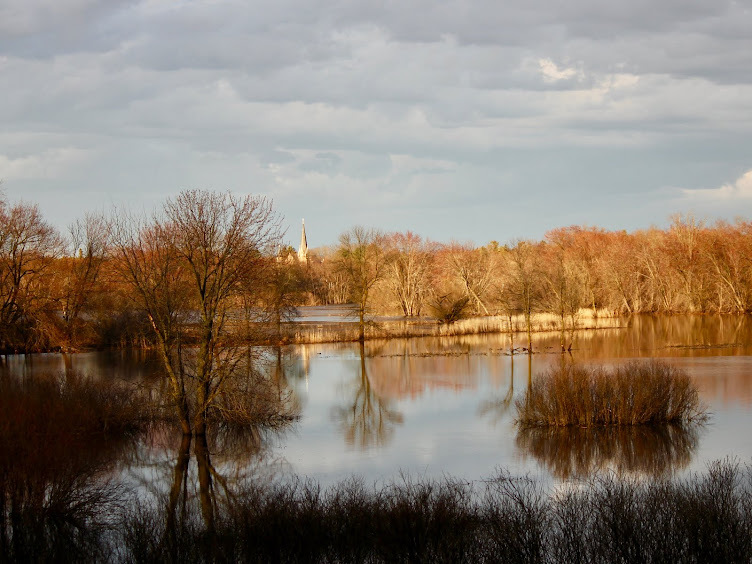 We lived in Neillsville, Wisconsin where I was born for a few years, then we moved to Racine and Kenosha, Wisconsin, back to Neillsville, then Black River Falls, back to Neillsville again, and then sometime in the fall of 1954 my family moved back to Black River Falls Wisconsin. 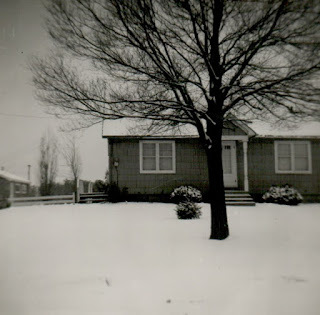 This was the first Christmas in the new house on Pine St. We thought it was a beautiful house but driving past it later in life, it was a very small house. That is true with most of my childhood homes. Things seem so much bigger from a child's eyes. We always had Christmas on Christmas morning. We always had to wait for Santa Claus to come. Unlike kids now, we didn't get something everytime we went to a store. I don't even remember going to that many stores. This was before there were malls or shopping centers. 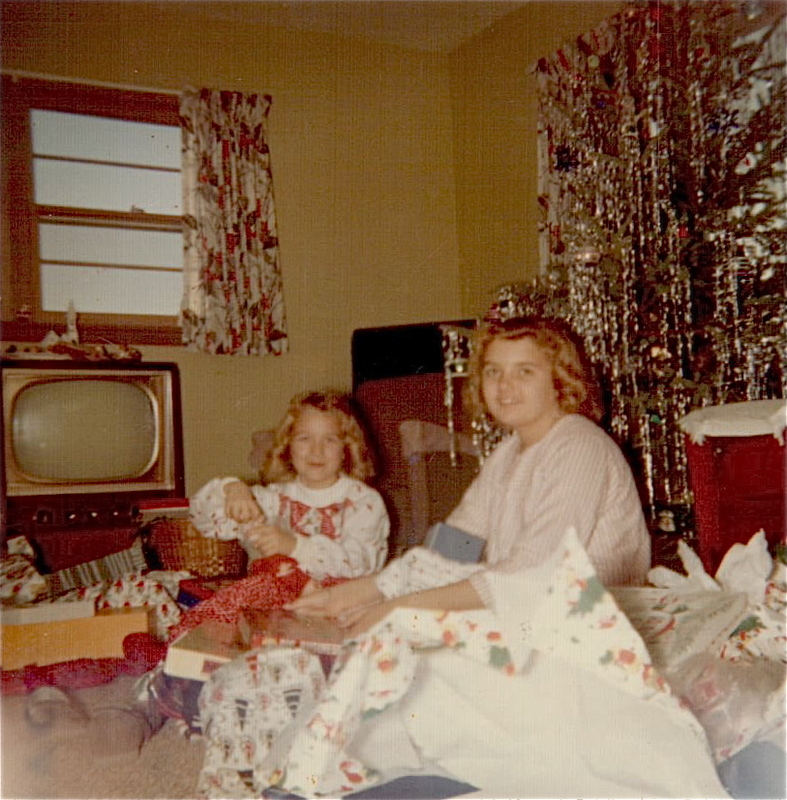 Mom saved everything we needed to be wrapped up for Christmas. We got underwear, socks, pajamas, winter coats, and then a couple toys. 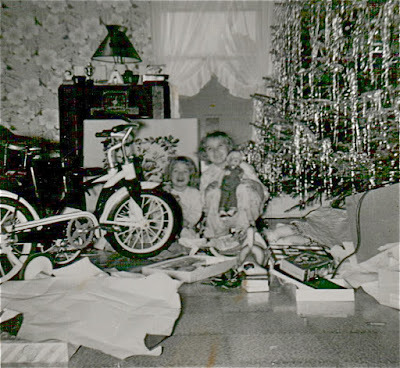 Christmas morning was always so exciting. The stockings we are holding were made by my mom's very best friend. When I became an adult, I copied the pattern and made several over the years. Even the Christmas stockings were smaller back in the day. 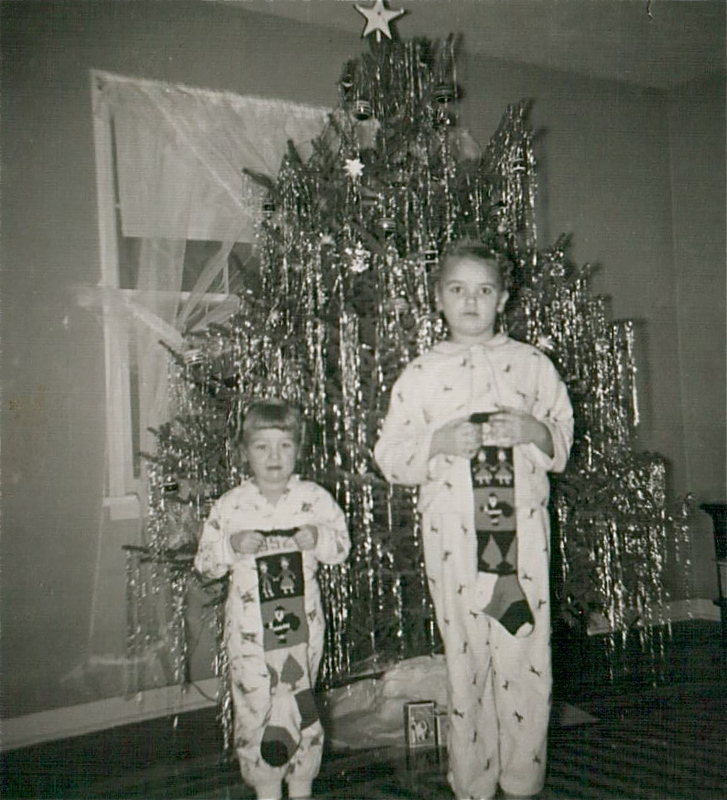 My sister and I are holding our empty stockings. 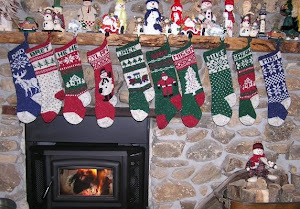 The old stocking is on the left, new on right. It looks like baby dolls were the main gift that year. 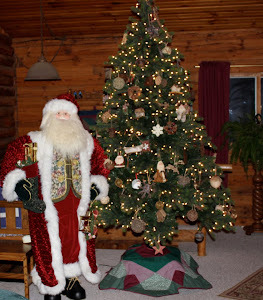 The next Christmas was in the same house. 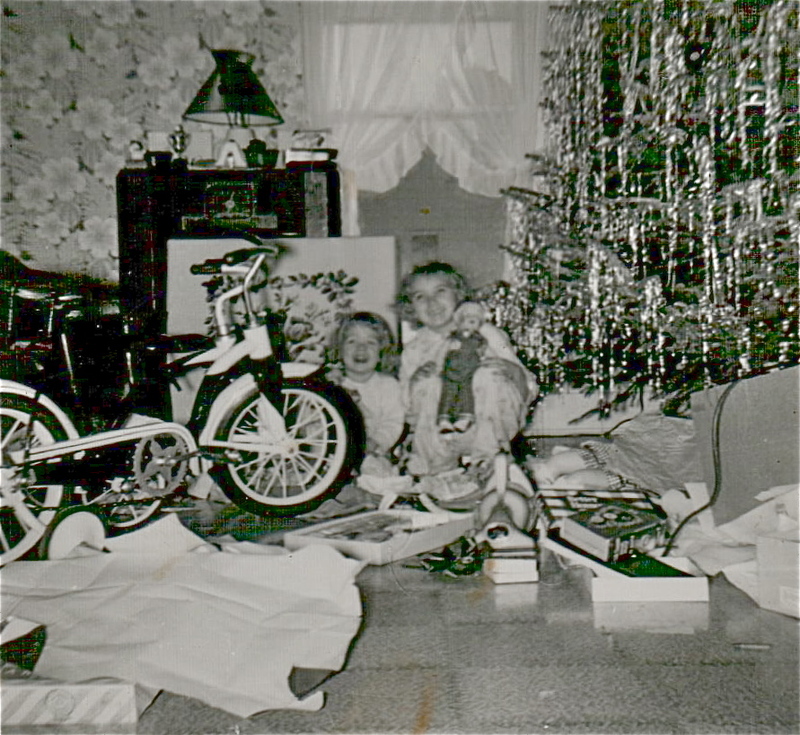 It looks like we had a very abundant Christmas in 1955. It is so much fun seeing the toys. Here we are in our pj's again, only this time we have our hair set for church. Notice how everything revolves around domestic activities. Taking care of babies, ironing, and washing clothes. This was way before the woman's liberation movement and back then the girls received "women's work" gifts. I do see a sled for a little recreation. 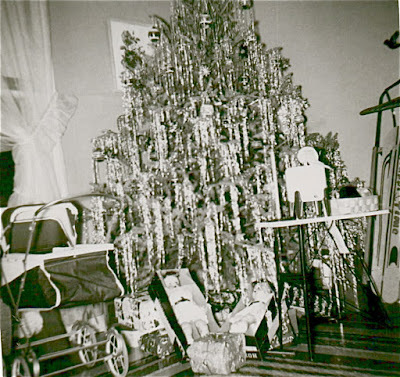 Dolls, a buggy, toy washing machine, an ironing board and a sled. Wow! 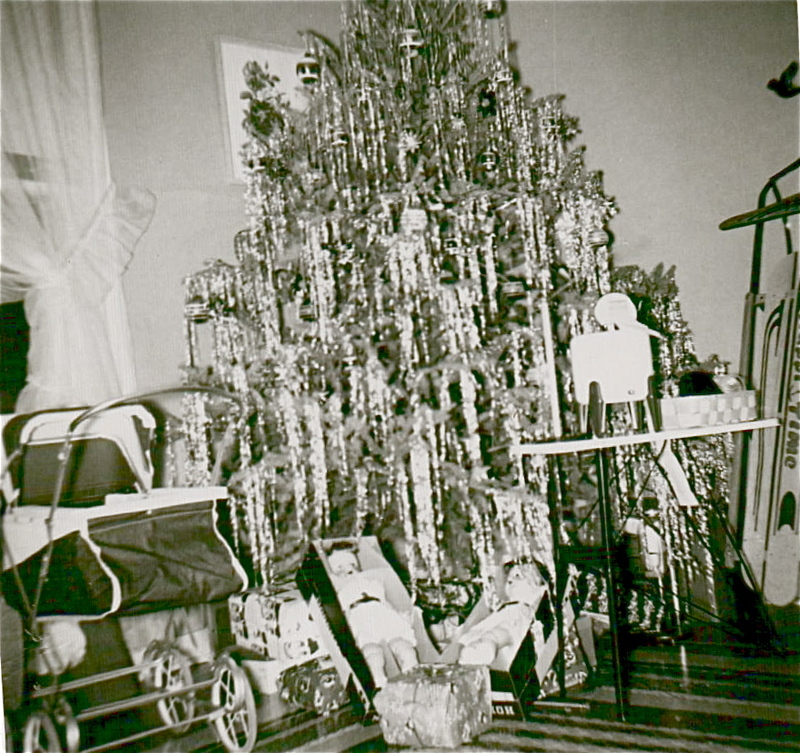 I think the next photo was the Christmas of 1957. 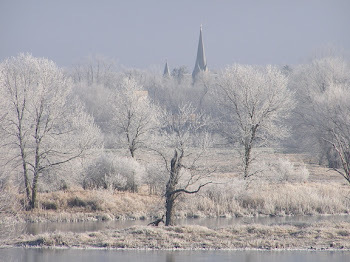 Our family had moved to Stoughton, Wisconsin the previous February. We first lived in an upper apartment. Then we moved to the lower unit. Although the curtains are the same, the floor and walls are different so I believe this is either the upper or lower apartment in Stoughton. There is no date on this photo either. We were sad about moving again, so it looks like Santa bought bikes for us. 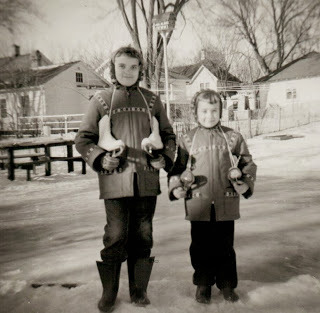 Either that year or the next we also got ice skates. My dad flooded the backyard so we could go skating every day after school. New bikes this year and I don't even remember getting them. Within a couple years my parents built a house, and we moved from the two flat. I think this was the first Christmas in the new house. We lived there until I was a junior in high school. 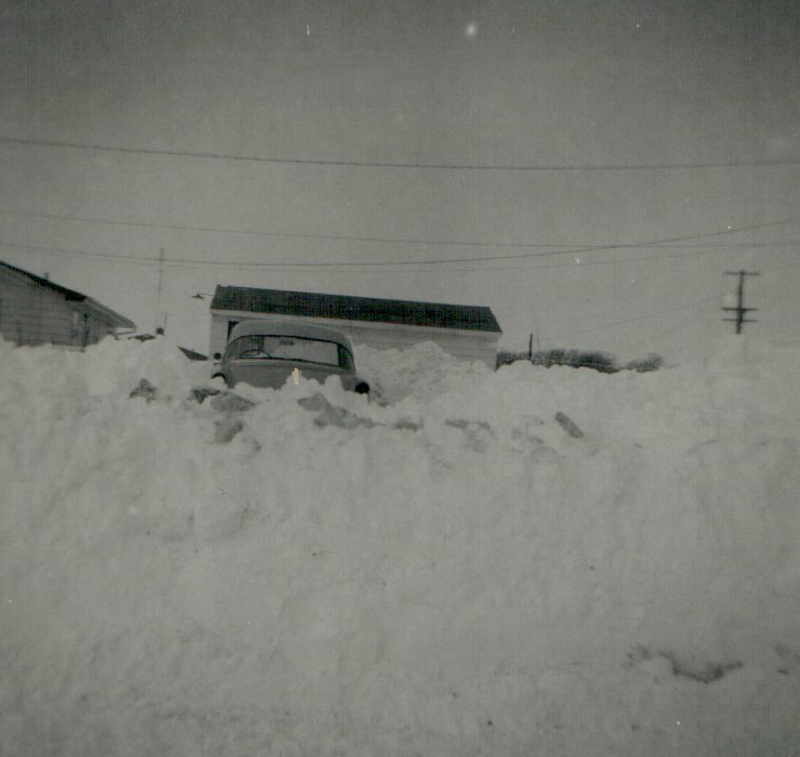 We had a lot of snow that year. Although the houses are different, unfortunately our hair styles remained the same. It's fun to look back and see how much times have changed. It was a quieter and a more naive time. 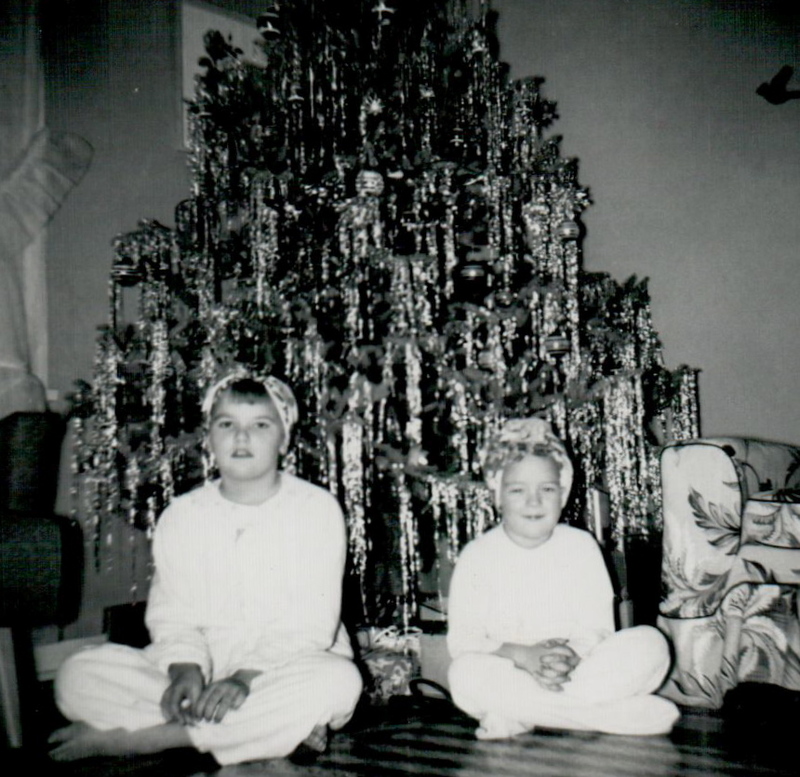 We can never go back for real, but somehow these Christmas photos helped relive happy times that have passed.